By the time I had become deeply involved in the world Eddie Condon and Milt Gabler had created for all time, it was in some ways too late. 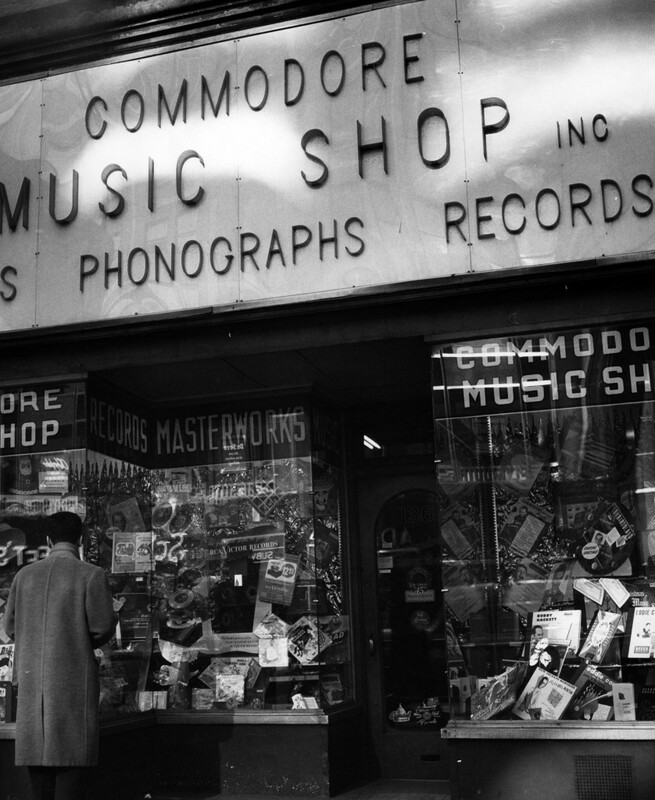 I was able to see Eddie in person three times in 1972, but when I bought my remaindered copy of EDDIE CONDON’S WORLD OF JAZZ (in 1967) the Commodore Music Shop had already been replaced by some anonymous urban architecture. So I am very grateful that the Hagley Library has posted photographs by Victor DePalma in its exhibition. You’d hardly expect that “100 Years of Picturing the Nation’s Business: Photographs from the Collection of the Chamber of Commerce of the United States of America” would be so stirring, but what a delightful surprise. 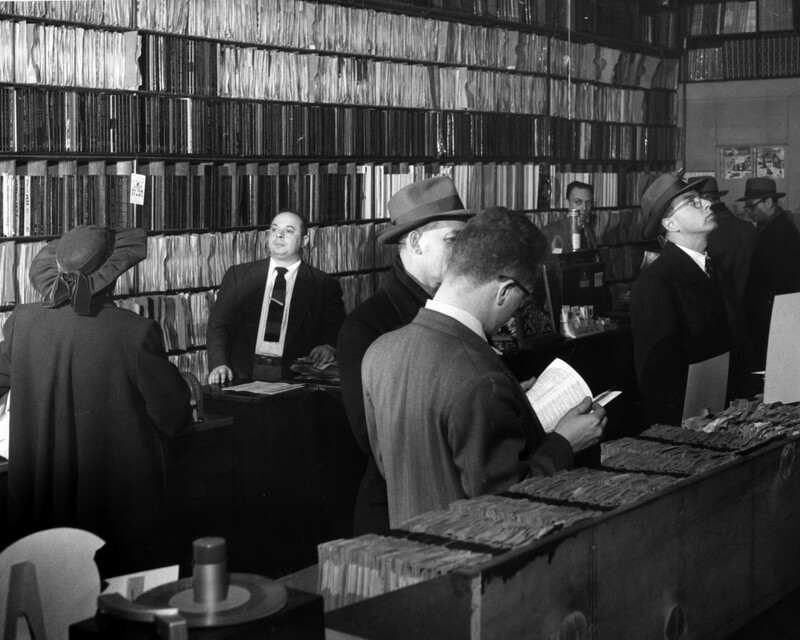 DePalma’s photographs were first seen in a 1950 article in NATION’S BUSINESS (the magazine of the Chamber of Commerce) on, of all things, record collectors. And two of the photos — there are five on the site, so please do visit. Were it there today, I would feel a deep urge to go in there and bow. Reverently. It’s not just the “records” — it’s the love of the music made tangible through the faith and enthusiasm of Milt and Eddie and their friends and families. This one’s for Maggie and Liza and all the men and women who make Commodore-flavored music to lift our spirits. 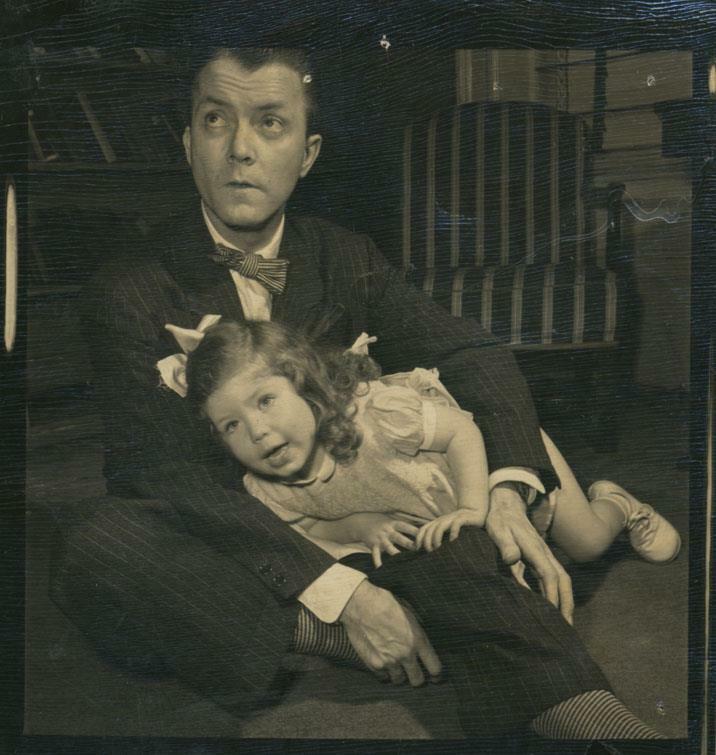 “Uncle Da Da” was what Maggie and Liza Condon called their father, the man whose birthday we celebrate today. We miss him. I am always fascinated by the music that my beloved players and singers make — how do they do that? — but I am also intrigued by them as people. Since many of my older heroes are now dead, I have occasionally tried to speak to their spouses and children to find out more about the mysteries of creativity. I realize that some of this is the sweet silly fantasy of a born hero-worshipper, that if I knew what Bobby Hackett liked to eat for dinner I would understand just a little more about how he made those sounds. My questing hasn’t always been rewarding. Many of the spouses of jazz musicians have understandably been reluctant to retell “the good old days” at length because the memory of all those who are no longer here is mixed with the awareness of their age and pain . . . making them blue. And the children of jazz musicians (with some lovely exceptions like Leo McConville, Jr.) have often been reticent. I once spoke to the daughter of one of my heroes and asked if she would be willing to talk about her father to me, someone who admired him greatly. She was truly puzzled. “What would there be for me to tell you?” she asked, and when I made some suggestions, she politely said she would have to think about it, which we all know is a sweet way of saying No. And the conversation never happened. 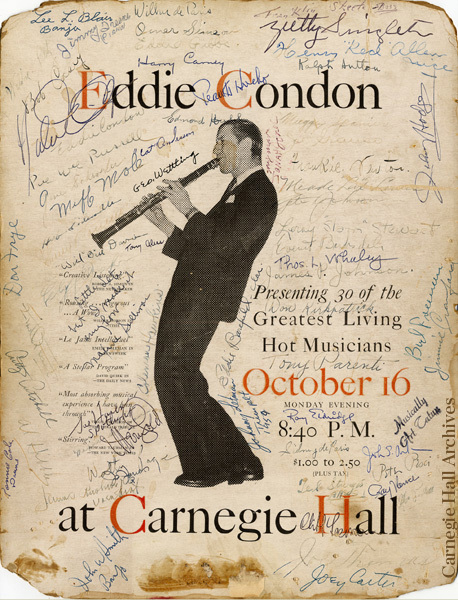 Eddie Condon is one of my demigods — small in stature, deaf in one ear, but the catalyst for some of the greatest moments of the last century (if you think I hyperbolize, please listen to any recording of his Town Hall Concerts or — if you have only three minutes, try TAPPIN’ THE COMMODORE TILL) and someone who made racial harmony possible two decades before Jackie Robinson. I have met and talked with his older daughter Maggie — and am honored by her conversation and grace. I never spoke to Eddie’s Phi Beta Kappa wife Phyllis, and I only saw Eddie’s younger daughter Liza (she died in 1999) at a distance, when she was photographing the Sunday afternoon jam sessions at Your Father’s Mustache in 1972. All this is long prelude to an announcement. Romy Ashby (writer and artist) sat down with Maggie in early 2011 — in the Washington Square North apartment that was once Amy Vanderbilt’s, then Eddie and Phyllis’s — and the two of them spoke at length about the Condon family and especially Liza, beautiful, creative, mysterious, irreplaceable. It has been published as the first issue of a magazine called HOUSEDEER (that’s another story) and it is available for six dollars here: http://www.housedeer.com. Much of what is called “memoir” has a certain self-absorbed rancidity. People who have not been able to accept the past as in some ways past use their pages to punish the dead, to settle old scores — or to explain their own unhappiness. The essay on Liza and her family in HOUSEDEER is free from rancor. It is full of feeling but not formally sentimentalized. Liza’s beauty and strangeness and generosity of spirit comes through. At the end of my first reading, I felt so sorry that I had missed her (even though my nineteen-year old self would not have known the right thing to say) but I felt as if she had been brought back, living and supple, to enter my thoughts. For those of you who live for jazz gossip. there’s a-plenty here as well. You can visit or eavesdrop or spy on Eddie shaving, on Phyllis lying on the bed reading the newspaper, on Eddie as a domestic sculptor, of dinner with Johnny Mercer and ice-cream sodas with Lee Wiley . . . and it develops into a full-scale portrait of Liza, someone who always insisted on taking the scenic route. If you love this music and you are fascinated by how human beings try to progress through this world, you will want to read the first issue of HOUSEDEER. 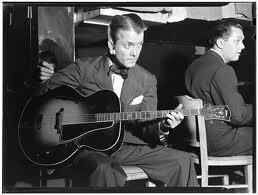 Posted in "Thanks A Million", Awful Sad, Generosities, It's A Mystery, Jazz Worth Reading, Pay Attention!